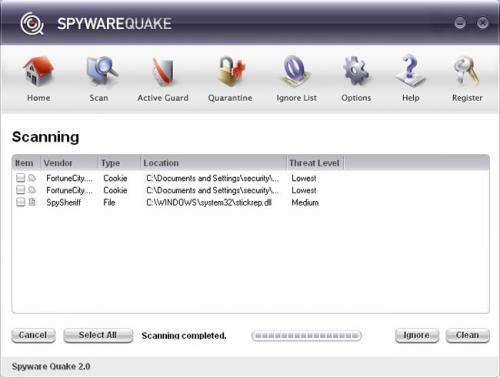 SpywareQuake looks like a legitimate application for removal of spyware, but it's installed by a trojan in an attempt to trick you into buying it. SpywareQuake will also pop-up fake alerts that resemble system alerts in another attempt to get you to buy it. Do not buy SpywareQuake. Remove it. To get SpywareQuake completely and properly removed, smitRem needs to be run from the user account that is infected. Download smitRem.exe ©noahdfear, and save the file to your desktop. If you look on your desktop you will now see a folder called smitRem. When you are at the logon prompt, log in as an Administrator. When your computer has started in SafeMode and you see the desktop. Click on Start > Control Panel > Double-click on the Add or Remove Programs icon. Find the entry for SpywareQuake and double-click on it. Follow the prompts to uninstall the program, but do not allow it to reboot the computer if it asks. If there is an uninstaller present for an infection that smitRem removes it will start this uninstaller. Simply click on the Uninstall button and allow the uninstaller to finish. When it is completed, it will close automatically and smitRem will prompt you to continue. Now you should press any key to continue. Important Note: If you need assistance with SpywareQuake, please start a new topic in our Malware Removal Forum. Edited by admin, 12 July 2007 - 04:16 PM.